This residential service-learning program immerses learners in the life of Earthaven Ecovillage. Participants join the homes, lives, businesses, and farms of the Taylor Creek Watershed community for a hands-on, skill-building, life-changing experience. 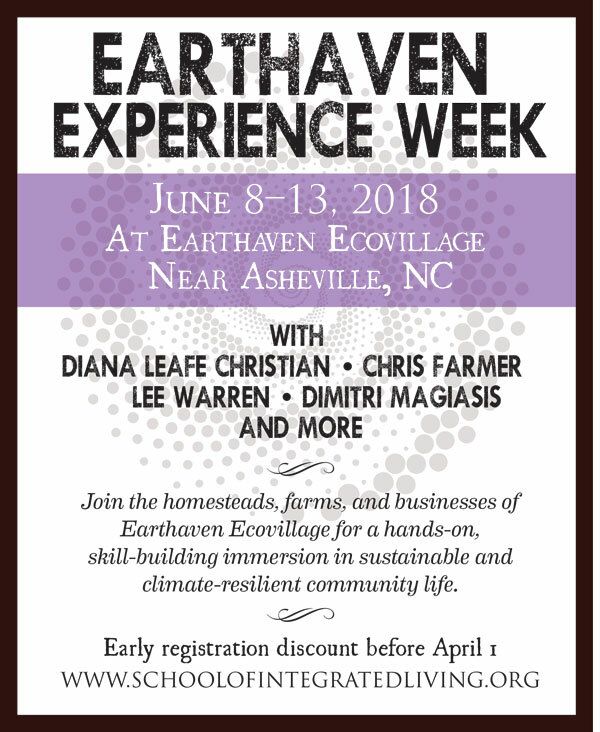 The Earthaven Experience Week curriculum encourages participants to examine sustainability through social, ecological, economic, and eco-spiritual lenses. The learning journey weaves large-group discussions and classes together with intimate hands-on experiences in the village and farms alongside community members. SOIL instructors, together with the community at large, support participants to build important skills, foster awareness for global issues, empower the self, increase connection, and develop the resources required for daily life. Check out a photo gallery from last year’s Earthaven Experience Week! I’ve visited several intentional communities and talked to members of others over the phone and never encountered discrimination of any sort, especially based on a person’s age. With age comes wisdom! Intentional communities typically are a mix of all ages and racial background, etc. Have visited some IC groups in the past, but was advised that at 68 yrs I’m too old. Is that about right for Earthaven too?